Once there was just Natalie. And then there was Alphonse, too. Natalie mostly doesn’t mind Alphonse being there—they both like naming pigeons (“Banana!” “Lorraine!”), bouncing things off bunk beds, and sharing a story together on the chair. But Alphonse sometimes draws on things that Natalie has made. 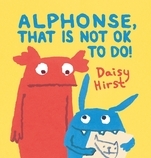 And when she finds him eating her favorite book, she’s had enough: “Alphonse, that is not OK to do!” With bold illustrations and a subtle touch, Daisy Hirst visits the familiar territory of sibling squabbles—and the touching bond beneath it all that sees little monsters through. Two siblings have a falling-out and make up again in spectacular style in a warm, witty story with sure appeal for little monsters everywhere. 40 / 9 13/16" x 10 1/4"
Daisy Hirst is the author-illustrator of The Girl with the Parrot on Her Head, her debut picture book. She received an MA in children’s book illustration from the Cambridge School of Art and lives in London.